Social Research has linked dissociation with high levels of activity on Facebook, Twitter, . But it's important to narrow in farther and distinguish what kinds of activity the dissociationalists are engaging in, since hours of scrolling through your news feed, though time-wasting, isn’t exactly self-centred. And people post online for different reasons. For example, Twitter has been shown to sometimes fulfil a need to connect with others. The trouble with determining what's normal and what's dissociational is that both sets of people generally engage in the same online behaviours, they just have different motives for doing so. In the Stages we begin to comprehend that we have the power to recharge our lives whilst stoping being dependent on substances or other people which we have used as an act of escape into the unreality of dissociation from ourselves and others. We have constructed for ourself an illusion a constant unremitting search for a quick fix which robs us of both our self-esteem and security. At this time we become willing to accept understand and acknowledge the need to reparent ourselves that their does exist a truer self within that can heal and regain control of our lives, and that this is the reason – coupled with all of our unresolved childhood traumas!– that our lives has become so disturbed and dysfunctional. What are these childhood traumas and where do they originate every-time a child has been disrespected regardless of the reason the feelings and emotions start to become buried. We need to understand when we communicate with the child within that at the core of our problems are all the traumas we experienced as a child real and illusory. We acknowledge, and that’s why we come to the stages. When we and the child within can accept that when we can find a solution for the unresolved trauma of childhood coping strategies then the rash of our unresolved coping strategies, drugs,drink of will start to become manageable and quickly loose power over our lives. All our dysfunctions will start to normalise instead of remaining constantly in the manufactured state of dissociation, which directly runs into our need for drama and chaos. This is a very fragile and delicate operation which requires truth trust and consent to be manifested to the satisfaction of the child within us. The Stages seek to help search for a our version of the "Truth" and our truth when found,accepted will set us free from our escapism/dissociation and we learn that for us there is only one truth. This one truth is based on our daily reality. Reality is what is, whether we see it or not. Although truth is not subjective, our perspectives on truth can be subjective. Until we becomes enlightened to realised truth, and can see full truth of our life and history, our vision of truth will be partially distorted. We will believe things to be true that are false. Our knowledge of cause and effect will be limited. We will lie to ourselves and become deluded. Unresolved traumas block our vision to finding our truth. When we cannot resolve our traumas of childhood we are prevented from facing what has happened to us when we were at our most vulnerable as a child. We are forced to deny the painful and troubling reality surrounding our experiences, and until these experiences burst through our denial they will clouds our vision of who we are and what our rightful place in the world is. The true self the core of who each of us is, lives resplendent in our truth. It is connected to truth, and sees it clearly. When we reconnect with our true self and align with it in the full light of consciousness, we come to instantly recognise our own personal version of our truth which becomes a liberating peaceful force working at all times for our benefit, a whole and complete experience at this time a great weight lifts from us and for the first time we feel free. Our conflicts are starting to resolve themselves with the help of the guides on the study course and the ongoing introduction to our deeply buried intuitive voice. We come to believe that meditation and the quietening of our created parental voice begins to relax the judgemental voices that we have picked up in our dysfunctional childhoods. The understanding that our creation of a God/Goddess/Universe/Creator/Spirit/Higher Power are externalised judgemental voices which collude in keeping us in a cage of safety and dull us down into non productive coping strategies. We awaken the healing wisdom within us when we open ourselves to that clear power of our meditations. At this stage the seeds of our authentic selves and trust in the healing power of the truth starts to permeate back into our consciousness. We move into a quite neutral space and we reawaken a sense of anxiety and fear. At this time we recognise that we need reassurance that all is well and the constant unresolved anxiety is an illusion. We come to understand that since there is a form of universality within us, this is a our true self . We came to recognise that this God/personalised parental figure outside of us and beyond us, that this externalised God, who is essentially little more than an idealised, fantasy parent, can not save us and we are not being disloyal to reject it. The newly found self starts to reconstruct our lives. Basically,The coping strategy of the old belief system tells us that we can’t take care of ourselves because we are too wounded as children, too completely damaged, but we still believe in our illusion that our idealised Mummies/Daddies can still save us! We just have to put our faith back in this illusory Mummy figure hopefully a better fantasised Mummy than we had the first time around not the one who participated in crushing our personality and making us into such a deranged dysfunctional person. When we reach Stage 3 we have started to examine our beliefs, addictions, and dependent behaviour in relation to our buried childhood beliefs. We have to acknowledge that in reality we are living in a materialistic dominated society & culture. We explore new positive affirmations beginning our process to understand ourselves and how we are influenced in all aspects of our recovering life. We study with our trusted friends a new life affirming belief that we can really take care of ourselves and heal our own wounds, and we will consciously decide that this externalisation of our split-off inner self – this external God of an-others creation – cannot save us. This is our movement away from dissociation. This revised belief system shatters our unconscious, grandiose, and immature idea that we can be the king of our own self-proclaimed universe. The dysfunctionally created belief of other or outside God that simply place it on something external, which allows us all the while to keep alive a façade of humility. When we speak of God or Higher Power we are really speaking of the my own unconscious, grandiose feelings about myself, which follow the exact template of our idealised image of our dysfunction parental figures.Since this is our created illusion for an equilibrium in our world and an explanation for our disastrous relationships, we feel under threat and are constantly rubber banded into our past or catapulted into a seemingly disastrous future We have created our explanation for what we see as a failed life. Arriving at stage four we share with our trusted compatriots and the universe all those things inside of us for which we feel shame and guilt as we have come to identify them. Now at this time we have worked hard to believe that we do have a true and honest self within. We have come to understand at this stage that our old lives lived under the mounds of unresolved childhood trauma which we did not believe we ever had were buried. We had thought in the previous stages that we had cleared all our blockages.Here we review without judgement and attempt through self reflection to understand the motivation that others have placed onto our self, the child within. We will look within, explore to find out what else might be just be inside us. We will take an emotional inventory of the traumas foisted on us when we were a child without any judgement. These revelations might force us to discover that our parents or significant others really did mess us up worse than we first thought, and that we gain a realisation of the level of upwelling pain and anger coming from that discovery we are reaching the sticky roots of our dysfunctions and alienation. We gently arrive at the realisation that the old patterns of dysfunction and often addiction were really self-medication and the inevitable flight from reality as a child we required. We do not do any form of “moral” inventory, this will only replay our childhood traumas over again just by the mere fact that we are regurgitating from our past our morals, our own perceived “badness” and hurtful behaviour .The reasons being that the mere act of revisiting childhood traumas and the frozen self is that we have already been programmed to come to believe firmly that we have no true self. We have learned we were programmed to believe we are to be condemned at birth as less than. Therefore we are indoctrinated with a false unrealistic version of the self that attempts to root us into the deepest moral and inner goodness of an idealised fantasy society which reinforces our denial of our own inner truth of our child within. We are born perfect and must come realise the dysfunction is grafted on to us, with the overriding sick belief that others have taught us we are born to fail. We have been taught health is toxic which we go on to create in our world a numbing down to a zombie state of lack of emotions and feelings.We have become an automaton working at stuffing down our true feelings eradicating all traces of the beauty inside ourselves. Starting Stage five we push open the door to a new life coming to recognise and enjoy our own intelligence, strengths and creativity, remembering at all times not to hide these qualities from ourselves and others. With the newly found self-reflection as to where our acting out behaviour might have come from that is, an acknowledgement that our disturbed patterns are simply a replication of the traumas done to us when we were vulnerable and innocent and powerless in our own family as a child. We will now start to understand all the negative things that others have done to us. We will reject these previous lists of perceived negativity drawn up by our tormentors and the people who sort to control us. During this stage we will come to understand that by being forced to admit to this externalised God of an-others creation (which we have become convinced NOW is separate from the essence of us!) and to the controlling persons/adults/parents/teachers who bought into this deluded and dissociative philosophy. They rubbed salt into our already wounded self which only further traumatised us paralysing us both psychically and emotionally. We threw ourselves down a blind alley of despair, and further cut ourselves off the from deeper healing roots of ourself. We have come at this stage to believe and realise that this discovered child within once approached has the power to heal us and restore our sanity.Having experienced the realisations of our recovery journey we become willing to let go of guilt, shame and any behaviour that prevents us from loving ourselves and others. Now that having explored what was done to us and what motivates our dysfunctional behaviour. We revel in our new found freedoms which give us new powers to strongly reject the conformity of belief that we need to be pleasing in the eyes of this external God (Mummy), on this new basis for our lives we will be ready able and willing to be loved by ourselves once again. The belief of earned love which in the past had given us such a warm feeling inside, a dissociative feeling which we would mistakingly take for being a sign-marker on our path to love and enlightenment we instantly recognise at this stage we realise the game is up for controlling behaviour in our lives for we have the gift to instantly recognise our enemy. We need to always remember that no one but the family of the others is in reality responsible for our perceived “defective character,” we have to come to a conclusion that the responsibility is with Mummy herself! Mummy the one who we believe will always save us is the perpetual myth we are facing in this stage. She has everything do to with why our belief system are so messed up and constantly failing. We quietly meditate on compassion and loving kindness coming gently to the realisation that there is a strong chance that Mummy was passing on her own learned behaviour. We do not seek to blame anyone neither do we discount the damage done to us. We simply let it lie as a realisation and a product of our studies.We understand at last what has happened to us. At this stage we can make a list of people that our learned dysfunctional lives have harmed and people who have harmed us, and take steps to clear out negative energy by making a restitution of our childhood loving values and sharing our grievances in a respectful way. We come to understand the healthy alternatives to the behaviours we have exhibited in the past we explore new healthy alternatives we can practice during our studies and discuss them at length. Starting now to recognise and understand the internal voices in our heads and where they originate from and who they may be. We come to realise the dysfunctional use of words forgiveness and gratitude as a term of abuse used to control us. The victimisation of forgiveness the granting of forgiveness often only allows the abuser to redouble their attempts to exercise control over us and push us back into the dissociations past controlling behaviour. "Please Mummy/God, now that We’ve admitted how bad we are, and how much We’ve hurt you, and how naughty We’ve been, will you love us again and tell us that I’m a good boy/girl? We’ll do anything you say. We really do love you, We really, really do. And We always did love you deep down, even though you did horrible things to us which we can’t seem to remember anyway because we had so pickled ourselves with booze/drugs/dysfunctional behaviour's to try to blot out the memories. Please tell us We are a good boys/girls again!" The reinforcing guilt and shame that this stage addresses and the voices of judgement and shame that we recreate in our subconscious have once more to be addressed with a greater understanding in our stage 7 self reflections. The stages whilst we are a study course we have to look at our actions connected to our previous work. This stage is about learning how to express empathy and understanding coming to increasingly appreciate the wonder of our newly discovered life and the blessings we do have. We learn to understand the suffering of others. Now We are really going to change our viewpoint and perspective….. We are going to stop being a bad boys/girl s and be a good boys/girls again, and prove to us that We really were good boys/girls all along, even though deep down underneath all our grandiose façade We still think that We are the pathological, worthless, evil, vile, stinking, rotten, useless, hopeless, piece of dogs**t that our messages from the past always subtly and sometimes not so subtly taught us .This the reasons why we drank/drugged so much and so destructively... We start to perceive our life differently in the light of the mixed messages of childhood..."But now We are going to make it all right for the world, even though I’ve still never even come close to looking at the harm that you, Mommy, and you, Daddy, did to me. But We are the bigger person! We have already forgiven you – even though We really have no clue exactly what We have forgiven you for." Change is found at this stage by acknowledging our inner child's voice by understanding at a deeply conscious level what we can accept that voice, without judgement confronting the denial in our own parental voice. What we cannot list or acknowledge we quietly rest in our self created playground of at this stage of the course. 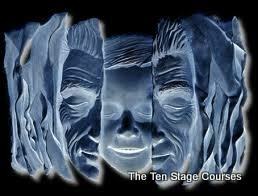 In stage nine we acknowledge the length of our journey acknowledging that have come a long way. We have learnt to trust our reality and daily affirm that we see what we see, we know what we know and we feel what we feel. We promptly admit to dissociated behaviour and make amends to ourselves when appropriate, but we do not say we are sorry for things we have not done and we do not cover up, analyse or take responsibility for the shortcomings of others, or their learned abusive parental voices. We’ll have started to change our ways but lets not fool ourselves again dissociation is a deeply ingrained behaviour and at this stage we may slip back into a classic dissy trap. We have become so dissy and split-off from our deep and churning inner rage and fury and misery and sadness over what was done to us that we’ll fool ourselves once more returning to our classic trap into believing that now we come so far on our journey that we we can relapse back into the old delusion of the perfect child now we can become fixed as the Best Little Boys/Girls in the whole wide world. At this stage is the recreation of the dissy personality where thinking we have cracked all our problems we set out once more to prove to others and the world that now we’ve finally changed. And On the surface WE WILL appear to change. We’ll be sure we seem different. We won’t get plastered and get violent for no reason and puke all over the new carpets and drive like an intoxicated maniac and frighten the hell out of everyone and force others to live with a pink elephant in their living room. No, the only pink elephant left in our life will be the pink elephant of my entire unconscious, which we won’t notice anymore because it will just get in our way. We’ll smile and convince ourselves that we are reformed, even though underneath it We’ll still be as dissy and deformed as ever. Dissociation (DIssy) is not reality and until we come to a deeper understanding of what has happened to us no healing can take place, no meditation will work, no religious practice will have any meaning. We will remain deeply dysfunctional without the symptoms being visible the cancerous cells of our hurt self will move ever onwards.Our messages from childhood remain deeply entrenched paralysing us into our old states and rubber banding us back into unresolved pain and suffering. We have to do a course of actions that will transform our lives we have to practice loving kindness and live out compassion for ourselves and others with whom we have little to no connection both animal and human. We start to seek out new situations,jobs, and people that affirm our intelligence, perceptions, and self-worth and avoid situations or people who are hurtful harmful, or demeaning to us. We will have gone deep inside the roots of our being to affirm our health. In our found reality, without just practicing splitting off from living in the present moment. We stop looking at our fantasy illusions and we stop making it look fancy to myself and others. We will stop talking to God of another understanding in prayer because We have no idea who God really is. We will listen to the universe in meditation and be able to realise that We are affirming the deepest and most basic essences of our souls. We will have found ourselves and will now have a beautiful full capacity that I’m come home to myself at last! Now that We have started to become enlightened and free from the twisted thinking ( theres not ours) that resulted in our dysfunction (that is, not dissociated) and no longer need an addictive process to achieve this dissociated state, We will understand real peace in our reality.We will not and go out and begin a mission to proselytise my version of “the truth.” We will renounce the idea that we have to manipulate others who use addictions to dissociate from their unresolved childhood traumas to follow their ( another form of recovery largely unreliable program) and to split-off from their ancient wounds just as we have done. We will renounce the idea that we have to convert anybody by insulting and degrading and pathologising them. We have to acknowledge that It will reinfect us and rebuild the sick selfs very grandiose ways to cajole other traumatised addicts of the dysfunctional paths into dissociating by requesting that they follow our adopted methods and The Stages, but We will acknowledge this as our grandiosity and old outmoded coping strategy an enemy of our newly found reality and we will cease. Our STAGES Guides are committed, experienced and sensitive and are essential to the changes we go through in our work together.